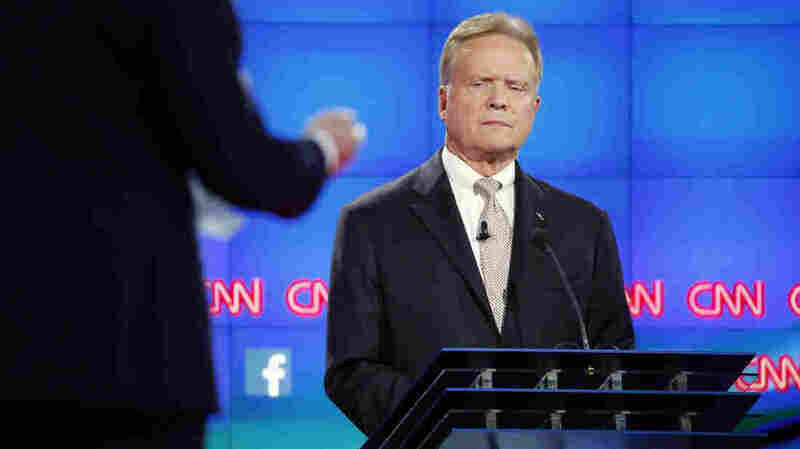 Jim Webb Flirts With An Independent Bid : It's All Politics The former Virginia senator complained repeatedly in last week's debate he wasn't getting enough time. Now, he could be leaving the party altogether for a third-party run. Democratic presidential candidate and former Virginia Sen. Jim Webb listens during the CNN Democratic presidential debate in Las Vegas on Oct. 13. Democratic presidential candidate Jim Webb announced Monday he is considering running for the White House as an independent instead. The moderate former Virginia senator has struggled to gain traction in a field that's so far been dominated by former Secretary of State Hillary Clinton and the surprisingly strong performance from Vermont independent Sen. Bernie Sanders. Webb is set to discuss his plans and his candidacy so far in a press conference Tuesday at 1 p.m. in Washington. Webb's difficulty at finding a space in the current party was on display in last week's presidential debate — he spent most of the evening complaining he wasn't getting enough time (he only spoke for 15 minutes per NPR's count, compared with about 30 minutes for both Clinton and Sanders) or asked enough questions. His protests were parodied to perfection by Alec Baldwin on this past weekend's Saturday Night Live. The centrist may have been at home in his party a decade ago, but it was evident during the debate that much of the Democratic Party had moved much further to the left than Webb was comfortable with. He's conservative on gun rights; supports coal energy, offshore drilling and the Keystone XL pipeline, and also had to explain his past opposition to affirmative action. He also served in the Reagan administration as secretary of the Navy. The one-term senator's national support is negligible — he averages just over 1 percent nationally — and he has made only a handful of campaign trips to early states. Still, if he runs as an independent, it could have an impact in his home state. Virginia is a swing state and is expected to be close again next November. And any division in support could impact the outcome for Democrats.